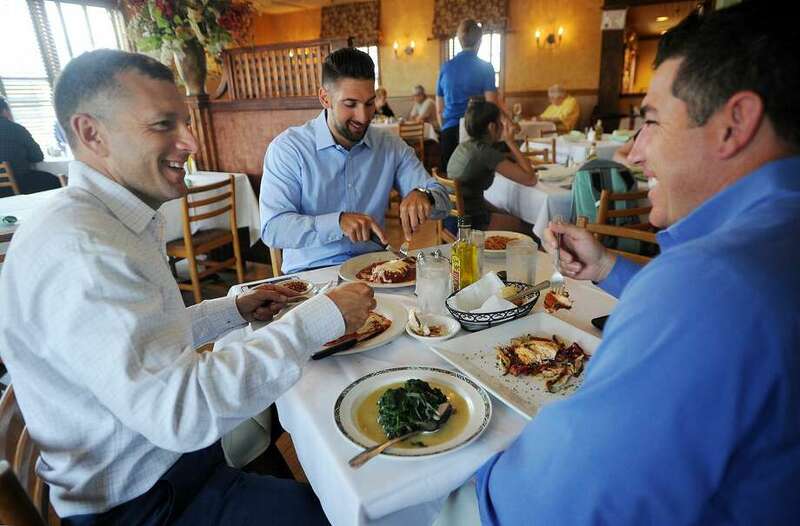 From left; Dave Rancourt, of Enfield, Joe Mish, of Wilton, and Carl Sturino, of New Milford, enjoy lunch during Dine Out Milford week at Gusto Trattoria Italian Restaurant in Milford, Conn. on Wednesday, July 19, 2017. During the week of July 17 to July 23 the restaurant, along with others in the city, features discounted prix fixe lunch and dinner menus: Serving Lunch for $17.95 and Dinner for $27.95. Click through the slideshow to see the other restaurants offering deals during Dine Out Milford. MILFORD — Area residents are taking advantage of the city’s first summertime restaurant week promotion with large crowds expected this weekend at the 11 participating establishments. Donato Serrano, owner of Reggiano’s Ristorante at 487 Bridgeport Ave., said he has been encouraging customers to make reservations through Sunday, the last day of Dine Out Milford, a week of prix fixe, or fixed price, menus. The start of the week has already proven busier than usual, he said. This year marks the first time the Milford Regional Chamber of Commerce has organized a restaurant week in July. The October event, on the other hand, has been held for about five years, said Lauren Gray, marketing and communications director for the chamber. During Dine Out Milford, which began Monday, customers of the participating restaurants can choose a variety of set options from a fixed-price menu, which offers an appetizer, entree and dessert for $27.95. Two restaurants are offering lower fixed-price dinner meals — Mexican restaurant Fonda La Paloma, at 1 Schooner Lane, set its menu options at $26.95, while Plan B Burger, at 1638 Boston Post Road, offers both lunch and dinner choices for $20.95. Some restaurants are also offering lunch options for $17.95. The other restaurants participating are Bin 100 Restaurant, 1638 Boston Post Road; Bridge House Restaurant, 49 Bridgeport Ave.; Eli’s Tavern, 21 Daniel St.; Gusto Trattoria Italian Restaurant, 255 Boston Post Road; Mexico Tipico, 1061 Boston Post Road; Monty’s River Grille at Great River Golf Club, 130 Coram Lane; Scribner’s Restaurant, 31 Village Road; and Seasons at Jeffrey’s Restaurant, 501 New Haven Ave. The full list of fixed price menus can be found at dineoutmilford.com. Riccardo Mavuli, owner of Gusto Trattoria Italian Restaurant, has been participating in the city’s restaurant week since the start. He said the special menus and promotion for his restaurant is well worth the cost of participating. “We do get a lot of new people and they do come back,” he said. Offering the summertime week of specials has been especially good for the establishment because it gets to show off the recent renovations to its facility, Mavuli said. Serrano said the summer is also a great time for restaurants to show off their patios and gives them additional capacity to handle the crowds. “So far, we’re having fun,” he said.